Organised in collaboration with the National Piping Centre, the Royal Conservatoire of Scotland and Glasgow University with the support of the Bagpipe Society, the Lowland and Border Piping Society, the Piobriaech Society, the Northumbrian Piping Society, the Royal Scottish Pipers' Society, the Traditional Music Forum and the William Grant & Sons foundation. 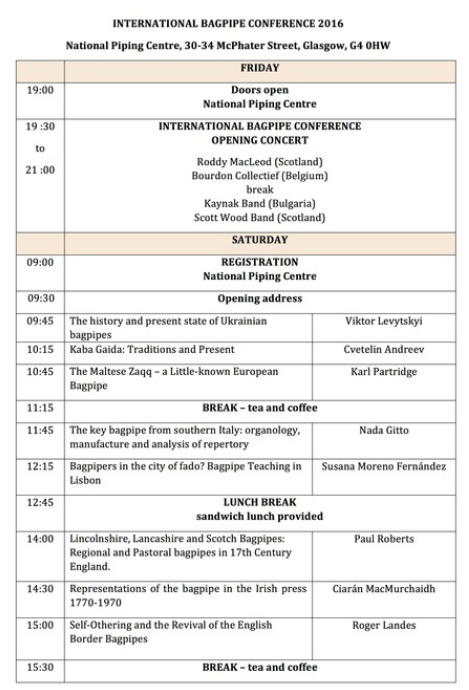 Bagpipe musicians, academics and enthusiasts from all around the world will gather at the National Piping Centre from 26 Feb to 28 Feb 2016 for the third edition of the biennal International Bagpipe Conference. This year, the Traditional Music Forum will be running a parallel session reflecting on teaching and learning Traditional Scottish Music. 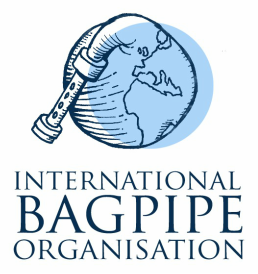 Previous conferences have featured pipes from Sweden, Croatia, Portugal, Spain, India, France, Scotland, England, Belgium and Belarus. List of papers to be presented at the 2016 conference. An interactive map for Britain (and beyond?) (Pete Stewarts and Julian Goodacre). National Museum visit 2-4pm (Edinburgh). Cars leaving from Glasgow early afternoon. Opening Concert featuring four different bands/artists from around the world including Belgium, Bulgaria and Scotland. Doors open at 7pm, concert from 7:30 to 9:30pm. Conference and social evening with an open mic/session and a Ceilidh. Tickets include a sandwich lunch and tea and coffee breaks. See the schedule for the full programme. Don't forget to bring your bagpipes for the social evening! The Traditional Music Forum will be running a parallel session from 10am to 3pm in the National Piping Centre, focused on teaching and learning traditional Scottish music (see their programme). Entry is free for all conference delegates. 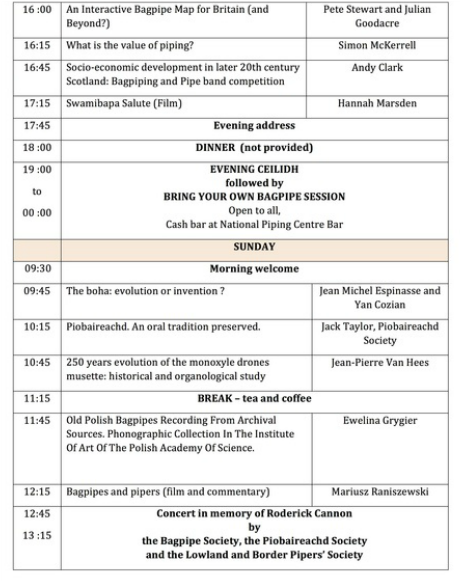 Conference and closing concert (end 13:15). Tickets include a tea and coffee break. The Saturday evening Ceilidh and the Bring your Own Bagpipe session are both included in the conference ticket.